Donkeys and mules in tourist hotspots are commonly used as taxis, carrying passengers or luggage. 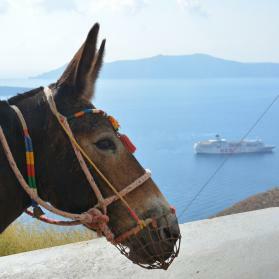 We’ve been working on the Greek island of Santorini since 2006 to improve welfare conditions for the 360 donkeys and mules working as tourist taxis. Wounds caused by poor quality equipment.